Violinist Lisa Shihoten enjoys an active career as a chamber musician, recitalist, and teacher. She made her New York solo debut at Avery Fisher Hall under the direction of Kurt Masur, and has received top prizes and awards from the National Foundation for Advancement in the Arts, the Marcia Polayes National Competition, and the Seventeen Magazine/General Motors National Competition. 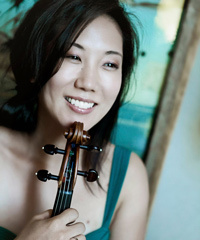 Ms. Shihoten is a member of the Concertante Chamber Players and the Jupiter Symphony Chamber Players, and has performed at numerous summer festivals, including the Caramoor Music Festival, the Ravinia Festival, the North Shore Chamber Music Festival, the Verbier Music Festival, the Aspen Music Festival, and the Norfolk Chamber Music Festival. She has also toured throughout Israel, Greece, and Turkey, and in this country regularly tours in duo recital with organist Ken Cowan. Ms. Shihoten received her Bachelor’s degree from the Juilliard School, and her Master’s degree from the Yale School of Music. Having taught at Princeton University, she teaches violin at the Rice University’s Shepherd School of Music in Houston.